One of the strange sounding words from Sukkot is koshiklach קוישיקלך (or sometimes spelled koishelach קוישלך). 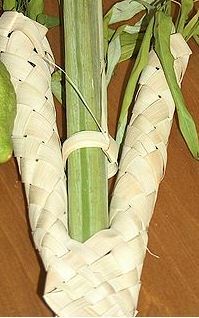 It refers to the woven holders used to bind the lulav to the hadasim and aravot. But what is the etymology? Let's start by taking off the suffixes and then we'll see what's left. The Yiddish suffix -ach indicates a plural, as in rogelach or kinderlach. So removing the -ach leaves us with koishekil (or koshikel)- and "-il" is a diminutive suffix. So koishiklach is the plural of "little koishik". But what's a koishik? While much of Yiddish comes from German and Hebrew, there's a significant amount that comes from the Slavic languages, and this is where we find the meaning of koishik - "basket". For example, basket in Polish is "koszyk" and in Czech and Slovak - "košík" or "koš". In fact, the Yiddish translation for basketball is koyshbol. O.E. cest "box, coffer," from P.Gmc. *kista (cf. O.N., O.H.G. kista, O.Fris., M.Du., Ger. kiste, Du. kist), an early borrowing from L. cista "chest, box," from Gk. kiste "a box, basket," from PIE *kista "woven container." This seems to me likely to be the origin of kos(ik) as being a basket in the Slavic languages as well. 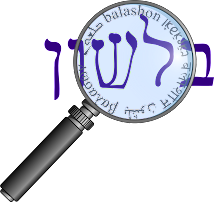 The precise meaning of Hebrew 'aza'zel עזאזל, found nowhere else in the Bible, has been disputed since antiquity and remains uncertain even to the present time. Over the centuries, exegesis of this name has followed three lines of interpretation. According to the first, Azazel is the name of the place in the wilderness to which the scapegoat was dispatched; the term is taken as synonymous with 'erets gezerah ארץ גזרה, "inaccessible region," in verse 22. Verse 10 may also suggest this interpretation. When translated literally it reads: "and send it [the he-goat] off to Azazel, to the wilderness." Yoma 67b understands 'aza'zel as "a fierce, difficult land," taking the first part of the word to mean 'azz עז, "strong, fierce". Both of the above interpretations are contrived. The third line of interpretation is preferable. Azazel in later myth was the name given to the demonic ruler of the wilderness. The derivation of the word is uncertain, but the thematic relationship of Azazel to the se'irim שעירים, "goat-demons," of 17:7 suggests that the word 'ez, "goat," is represented in it. The form 'aza'zel may have developed through reduplication of the letter zayin: 'ez'el, "mighty goat," was pronounced 'ezez'el and, finally, 'aza'zel. Bula, in the Daat Mikra, quotes the "fierce, difficult land" interpretation mentioned in Yoma (and by Rashi on the verse). In a footnote, however, he offers some additional options. First of all, he points out that the letter lamed might be added to the root עזז, as we find in a number of other nouns like barzel ברזל and karmel כרמל, and the alef was also added in, like in the word tzavar צואר. This would make azazel related to the Arabic azaz, meaning "hard, unworkable land". He then goes on to say that he doesn't think the theory that Azazel refers to a place of idol worship is likely, but even if it is true, it doesn't mean that the service was still associated with idol worship. He points out that there are many phrases in Hebrew that originally had idolatrous connotations, but received new meaning according to the monotheistic Hebrew approach. For example, he says that the phrase ריח ניחוח - "pleasing odor to God" (Vayikra 1:9) also was adopted by the Torah from the language of idolators, even though Judaism doesn't believe that God actually takes pleasure from smells. His last theory, based on the BDB Lexicon, is that perhaps it is related to the Arabic root עזל 'azzala, meaning "he removed", so this would refer to the removal of the sins, by means of the goat. In Modern Hebrew the phrase "lech l'azazel" לך לעזאזל means "go to hell". I don't think that this is due to an association with demons. The Even Shoshan dictionary quotes the responsa of the 17th century Chavat Yair as saying לך לעזאזל המדברה! - "go to Azazel in the desert!" So I think the idea here is just to send to an uninhabitable place, in a similar way that the Dead Sea is referred to in Talmudic Hebrew.